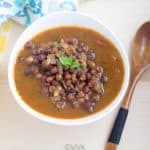 Masoor dal is the red split peas. But when cooked it turns yellow. 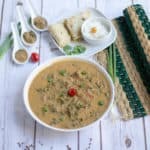 As dal is our major protein source, I am using 1 cup for this sambar. Please adjust according to your taste preference. 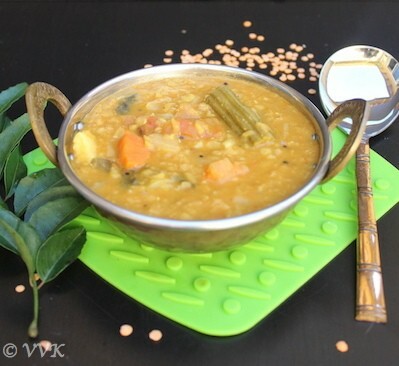 Here is a simple “One Pot – One Shot errrrrr multiple” (OPMS) pressure cooker sambar prepared with masoor dal. Once the oil is hot, add mustard seeds, hing and methi seeds. As they start to splutter add onions. Saute till there are translucent and now add all the veggies including tomatoes. Add salt, turmeric powder, jaggery and the tamarind juice. Mix the sambhar powder in the 1/2 cup of water (so as to avoid lumps) and add it. Add remaining water and masoor dal. Pressure cook it for up to 4 whistles. Let’s the pressure wean away and that’s it yummy sambar is ready. 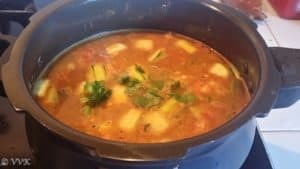 If you feel its too thick, add water to required consistency and let it boil for 5 minutes. 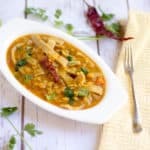 If its too watery, add 2 tsps of rice flour in 1/2 cup of water and add it and let it boil so that sambhar becomes thick. 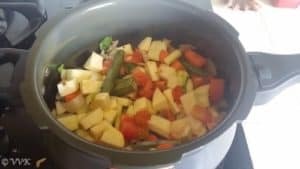 Adjust salt, sambar powder and veggies according to your taste. 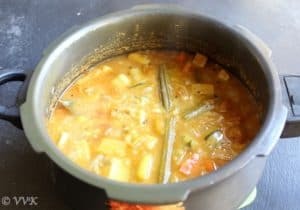 Authentic sambar in one pot one shot. 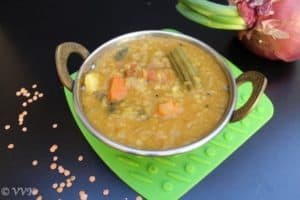 this pressure cooker sambar prepared with veggies & with the twist of masoor dal instead of toor dal. 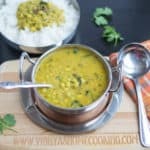 Once the oil is hot, add mustard seeds, heeng and methi seeds. Let the pressure wean away and that’s it yummy sambar is ready. 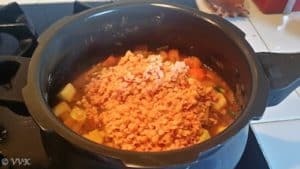 If you feel its too thick, add water to required consistency and let it boil for a 5 minutes. 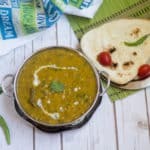 If its too water, add 2 tsps of rice flour in 1/2 cup of water and add it and let it boil so that sambhar becomes thick. 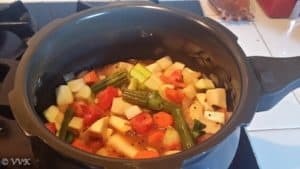 Adjust the spices, salt and veggies according to your taste.